Long divided between supporters and opponents of the socialist government and ravaged by shortages of food, medicine and other basic goods, Venezuelans are suffering through a political crisis that intensified in January, when Juan Guaido declared himself interim president. After a meeting in Ottawa Monday, foreign ministers from across the Americas threw more symbolic support behind Venezuelan opposition leader Juan Guaido in his bid to oust Nicolas Maduro as president of the country with the world's largest oil reserves. 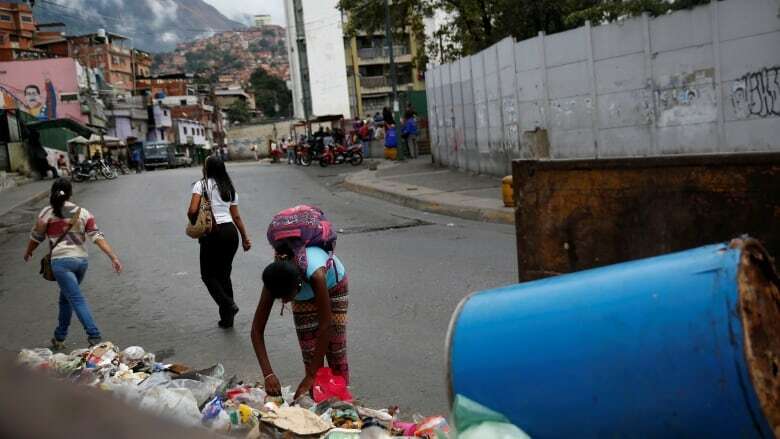 Long divided between supporters and opponents of the socialist government and ravaged by shortages of food, medicine and other basic goods, Venezuelans are suffering through a political crisis that intensified in January, when Guaido declared himself interim president. 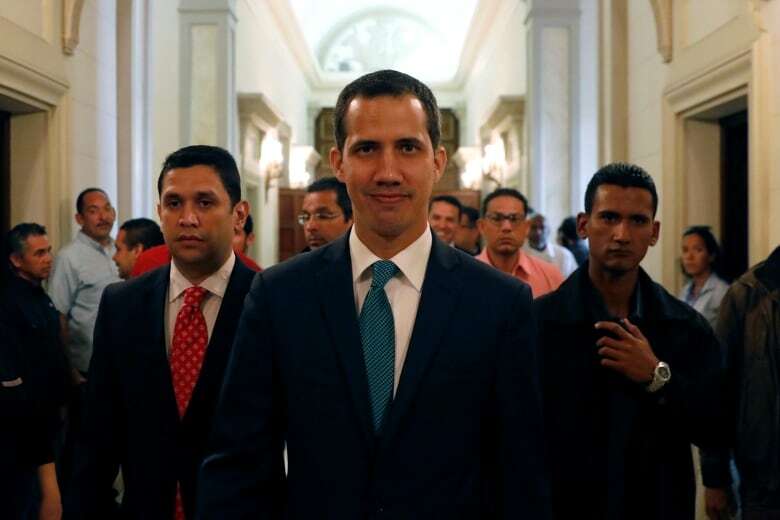 The U.S., Canada, Argentina, Brazil and the European Union have recognized Guaido as the country's legitimate interim leader while Russia, China, Mexico, Bolivia, South Africa and others contend Maduro is the rightful president. In the past week, hundreds of thousands of people have taken to the streets — both supporting and opposing Maduro. Saturday's opposition demonstrations were some of the largest in recent years. How did Venezuela get to this point? How should its political system be described? And how likely is foreign military intervention? CBC explains. Nicolas Maduro was sworn in for his second, six-year term as Venezuelan president in January. Canada, the U.S. and most countries in Latin America believe the May 2018 election that brought him to power wasn't free or fair, as key opposition leaders were barred from running, among other problems. The beginning of what the opposition considers Maduro's fraudulent second term is the stated reason why Juan Guaido, head of the National Assembly, declared himself interim president last month. Behind the scenes, officials from the U.S., Canada and other countries were corresponding with Guaido — who was little known in Venezuela or abroad before January, according to diplomatic sources quoted by The Canadian Press. "This was a planned thing. It was a co-ordinated effort with the U.S. and its coalition of the willing among Latin American countries," said Mark Weisbrot from Center for Economic and Policy Research, a liberal think-tank in Washington. "They used the date of Maduro's inauguration to claim that his presidency was illegitimate." Within Venezuela's previously divided opposition, U.S.-educated Guaido, who hails from Vargas, one of the country's poorest states, was seen as a compromise candidate between competing factions and was chosen to lead the National Assembly. Other leading opposition politicians have fled the country or are under house arrest as part of what they say is persecution by the government. Aside from the stated reasons for recognizing Guaido now, analysts said shifting political winds in Latin America have increased the pressure on Maduro. 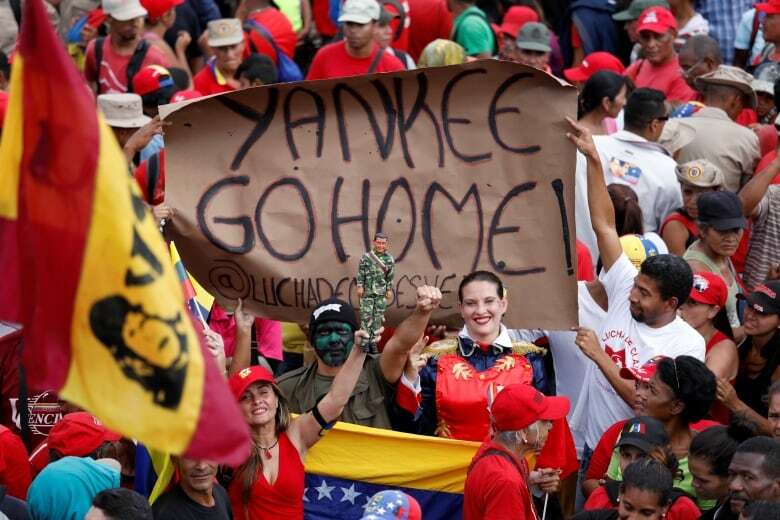 When Venezuela's previous president, Hugo Chavez, faced attempts to topple his government in 2012 with U.S. support, much of South America was governed by left-leaning parties as part of the so-called "pink tide." That meant the socialist government had more allies in the region. Today, Brazil, Argentina, Chile, Colombia and others are governed by right-wing or conservative parties — while left-leaning authorities govern Mexico, Cuba, Uruguay and Bolivia. 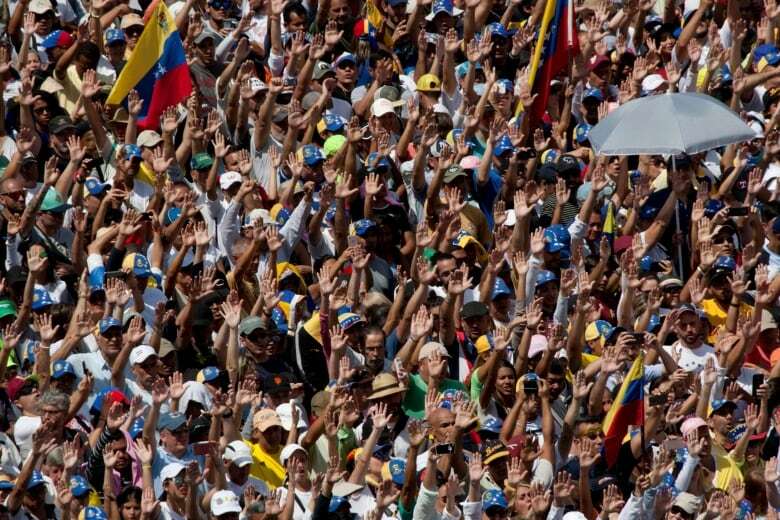 Moreover, Venezuela's current economic crisis — the inflation rate reached 1,300,000 per cent in the year ending in November, according to one study — means there is greater appetite for political change today, according to opposition supporters. What does public opinion say? Accurate public opinion polls in Venezuela are hard to come by. More than three million people have left the country amid shortages of food and medicine — voting with their feet. Many average people spend much of their days waiting in lines for food and are more concerned with daily survival rather than rallying for political change. Venezuelans report losing on average 11 kilograms in body weight in 2017, and nearly 90 per cent of the country lives below the poverty line, according to a study published by three Venezuelan universities last year. 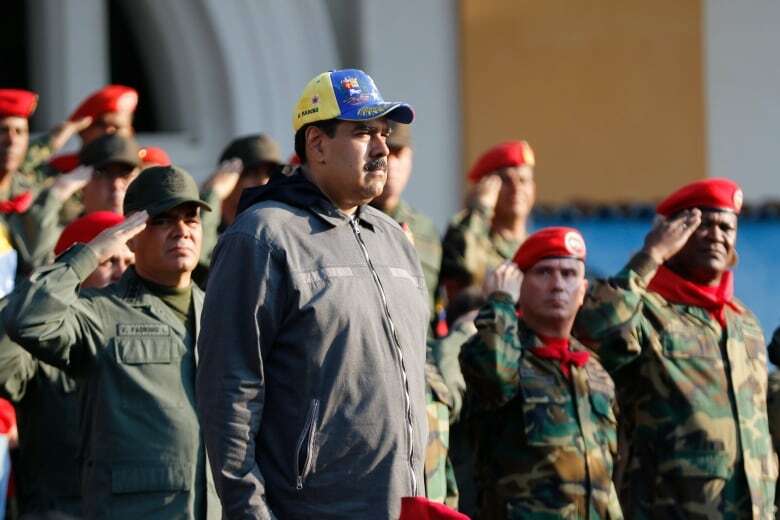 In a November poll conducted by Venezuelan public opinion research firm Datanalisis, 35 per cent of respondents said they backed "foreign military intervention" to remove Maduro from his position. More than half rejected the idea. A "negotiated settlement to remove President Maduro from power" was the most popular option for a way out of the crisis, receiving 63 per cent support. Between 20 and 30 per cent of Venezuela's 31 million people back Maduro's government, said Miguel Tinker Salas, a history professor at Pomona College in Claremont, Calif., citing public opinion data. "Maduro is the face of the economic crisis for most people, there is no doubt about that," he said. Dictatorship, democracy or something else? The socialist government under Hugo Chavez and later Nicolas Maduro had won a series of what were widely considered democratic elections. Chavez died in 2013 and was succeeded by his vice-president, Maduro. In 2015, Maduro narrowly beat opposition challenger Henrique Capriles to win the presidency by 1.5 percentage points. At the time, the opposition said the ruling socialists had used state resources in their election campaign and had threatened public employees with losing their jobs if they didn't vote for the ruling party, among other electoral problems. However, the opposition controlled a series of regional governorships and other posts they had won under the same electoral system. In 2016, amid a spiraling economic crisis, opposition parties came to power in the National Assembly for the first time in 16 years. The National Assembly was effectively neutered when the Supreme Court, packed with Maduro loyalists, took over its functions in March 2017. Later that year, the government created another body called the Constituent Assembly which was stacked with its supporters and bypassed the opposition-controlled congress. This, some critics say, is when the Maduro government's authoritarian tendencies slid into a dictatorship. In a North American context, it would be akin to U.S. President Donald Trump dissolving Congress after the Democrats won midterm elections, and creating a new body stacked with his partisans in its place. The most recent presidential elections held last year were widely condemned as illegitimate. Leading opposition candidates were prohibited from running, jailed or forced into self-imposed exile, amid other problems. And yet, today critical media outlets continue to report on the country and the opposition can bring hundreds of thousands of people onto the streets for demonstrations. To supporters of the government and even some opponents, this means the country is not a dictatorship — such activities, after all, would be prohibited in classic dictatorships such as China, Saudi Arabia or Eritrea. Government critics say the country is a dictatorship, because it doesn't have fair elections or an independent legal system. Like much in the politically polarized country, the best way to describe the Maduro government is a matter of debate. At their meeting on Monday, members of the Lima Group ruled out support for military intervention to end Venezuela's humanitarian crisis. Trump, meanwhile, has said "all options" are on the table and has not ruled out using force. White House national security adviser John Bolton raised the spectre of military intervention last month, when he appeared at a briefing carrying a notepad with the handwritten words "5,000 troops to Colombia," a country that borders Venezuela. "At this point, military intervention is a threat … it's simply a way to increase pressure on Maduro," historian Salas said. "To have a full-blown intervention, we would be seeing troop movements." So far, Venezuela's powerful military has backed Maduro, he said, despite efforts by the opposition to win them over. If Venezuela's military were to split, with some joining with Guaido and others defending Maduro, the long-term results could be devastating, he said. "If you do find a fissure … you may be looking at a civil conflict."